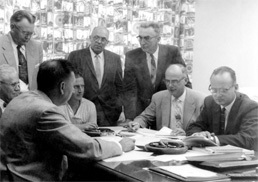 In 1957, the Insurance Commissioner for the State of Wisconsin issued an insurance license to Federated Rural Electric Insurance Corp. and by 1959, Federated had written its first policy. The Formation process had taken more than four years of meetings, planning and research by members of the Wisconsin Electric Cooperative (WEC) Job Training and Safety Committee. But at last they had set up an entity that allowed them to insure only electric cooperatives and start reaping the benefits of their excellent safety records. Since then, Federated has become what our founders envisioned: a steady presence in the market, committed to offering superior insurance programs by providing the best value in products and services for our members. Federated Rural Electric Insurance Exchange is committed to working with our Members to provide superior, value-oriented insurance programs with a focus on Safety, Service and Stability.